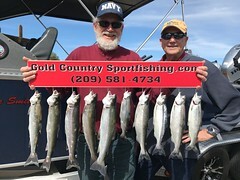 New Clients Kevin and Greg booked me for a day’s fishing trip on Don Pedro on July the 10th. We headed out to the fishing grounds and I set four rods at various depths and the started out instantly. I had told the guys that they could catch and release the ones and the ones they didn’t want, and so they did. 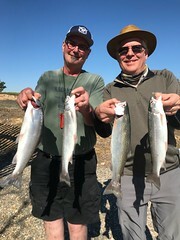 At about 12:30 they ended the day with their ten rainbows from the waters of Don Pedro. A great day with a couple of great guys. Thanks again you two. 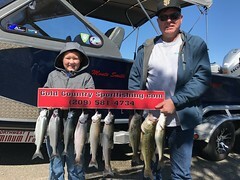 This entry was posted in California, Don Pedro fishing guides, Don Pedro Lake, Gold Country, Melones, Rainbows, Trout. Bookmark the permalink.